2002 in review: Happy New Year! The year started out with a bang with our annual trip to Utah to ski with Karen's family. Everyone took turns watching Gregory at the lodge so we got in a lot of skiing. At that point Gregory had just learned to do a funny little army crawl where he dragged his stomach and body around with his arms. 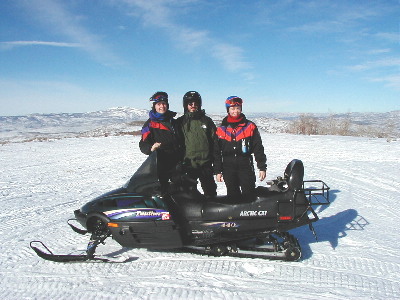 Karen also went snowmobiling for the first time. In February, Leo headed back to work after taking 3 months off to take care of Gregory. Karen had gone back to work 6 months after Greggy was born, working 4 days a week. Leo now works from home one day a week and his paternal grandparents come over and help him watch Greggy. 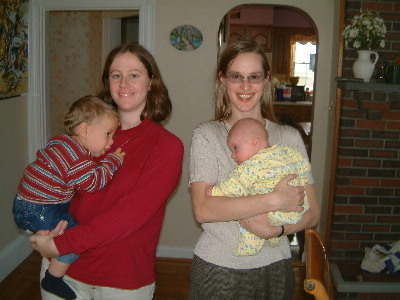 In addition, our friend Dawn started caring for Gregory 3 days a week. At the end of February Greggy came down with some kind of nasty infection. He started wheezing so we had to give him nebulizer treatments (sort of the equivalent of an inhaler). He was a little champ through it all. A funny highlight was Greggy diving into the full bathtub with all his clothes on! He sure does like his bath! In the spring Greggy started saying his first words, although there is still debate as to what they were! We think if was either "Eddy" (the name of one of our cats) or "kitty". Leo accidentally cut his pinky badly while cooking which caused a frantic trip to the ER. Luckily we have a hospital a few blocks down on our street so it was a short trip! 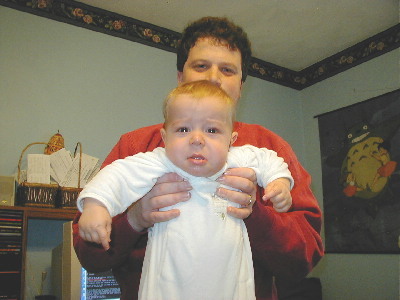 Speaking of cuts, Gregory also got his first hair cut! We also took a trip to New York City to visit Leo's sister Katya for her birthday. In May we celebrated Greggy's first birthday with 2 fabulous family parties, but unfortunately we had to cancel Gregory's birthday party with his baby friends because he had a cold. However, since most of his baby friends were born in April, May, and June there was no lack of parties to attend. 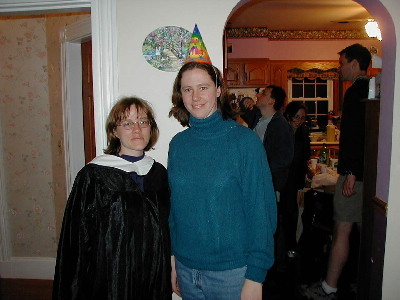 We also held a joint birthday party for Karen and graduation party for our friend Heather in May. We had the pleasure of attending our friend Nathan and Bridget's wedding in a gorgeous garden in Rhode Island. Gregory had a terrible rash (an allergic reaction to the antibiotics he was taking for a double ear infection), but the wedding was beautiful and we had a fun time. The main event for June was a week-long trip to Italy with Leo's parents and sister. We went to Rome, Siena, and Venice. 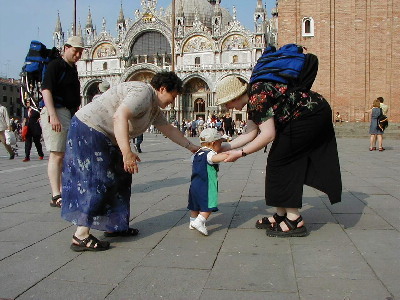 Gregory took his first steps in Piazza San Marco in Venice and we have it all on video! He took the steps because he was so excited about all the pigeons. He didn't take any more steps until a month later and then he quickly learned to walk around. For the Fourth of July we went up to Maine for the wedding of our friends Kevin and Allison. The wedding was beautiful, but very cold and windy! Karen brought a dress to wear but ended up wearing jeans for warmth. Oh well! 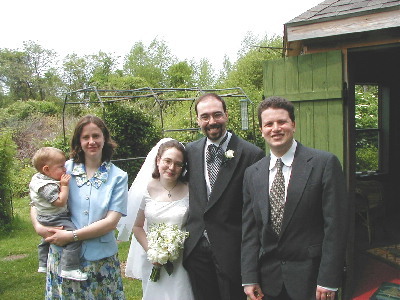 Karen's Dad and Leo's Mom saved the day by watching Gregory on various days in the next week just before Greggy started attending a family daycare with a great woman named Daina. 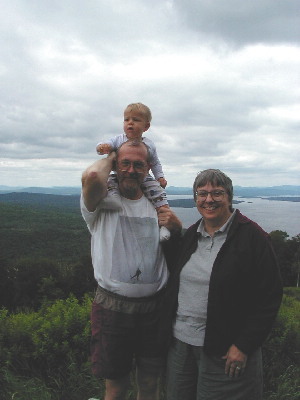 We also had Leo's parents and Barb and Jarrod watch Gregory while Karen and Leo went off for a camping trip with friends from UMass Amy and Andy and their new puppy Ada. Gregory's Aunt Barb and Uncle Jarrod built him a wooden sandbox in the backyard and bought a little inflatable pool, and those were an enormous hit until October when it got too cold. One highlight of August was a trip to the beach for Leo's cousin's Vlad's birthday. Greggy wasn't sure what to make of the waves at first, but then he loved it! Gregory also fell in love with escalators. We were ecstatic to learn that we were expecting another baby next April! 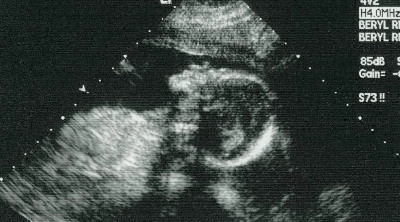 At the 19-week ultrasound, we found out that it's most likely a girl. In September we went to a family reunion for Karen's Mom's family in Chicago. It was great to see so much of the family and introduce Greggy. We have an incredibly fun family! Although Gregory is the first of the new generation, he has an adorable 2nd cousin once-removed named Chrissy who is younger than he is and stole our hearts! Cousin Andrew really bonded with Gregory too. Karen's cousin Jimmy also has a special relationship with Greggy and came to visit a bunch of times this year. 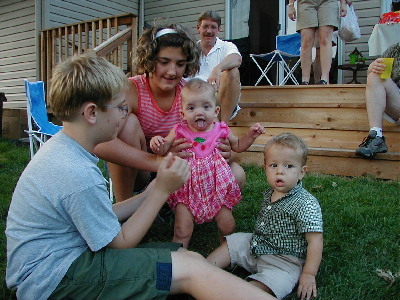 We were thrilled when our good friends Matt and Miranda had a little baby girl named Dana. It's been fun to visit them and act as the "experienced" parents. We also enjoyed having Karen's college friend Katie and her fiance Ryan stay with us for a few days. October brought Halloween and all its treats! 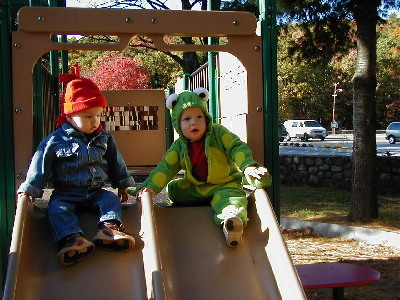 We went to a Halloween party hosted by Leo's cousin Tanya, went trick-or-treating at the mall with Gregory dressed as a little frog, and went to the annual Halloween Hike in the Adirondacks. We backpacked in and stayed in a little cabin that Gregory loved to sweep with the broom. Gregory's precious bear/blanket Mr. Lovie, who is normally blue, turned completely brown and was covered in snow. He has since made a full recovery. Karen's Dad helped us make some much-needed small repairs around the house while he stayed with us. 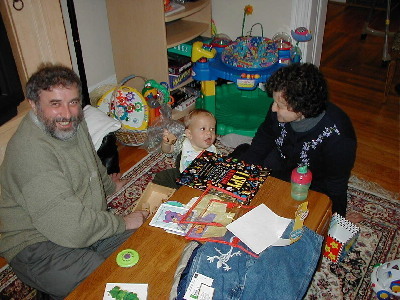 Gregory also started attending a new family daycare opened by our friend Lily. We all love it! The holiday season has seen lots of revelry, trips, and general fun. We went to Thanksgiving at Karen's Aunt and Uncle's house in Connecticut with a bunch of Karen's family. Gregory enjoyed playing bridge with the rest of us. In other bridge news, Leo became a Life Master this year! Sadly, his long-time bridge partner Otis moved away recently. Our friends Nathan and Bridget invited us over for a great Hanukah party, and our friends Heather and Vlad hosted a fantastic holiday party. 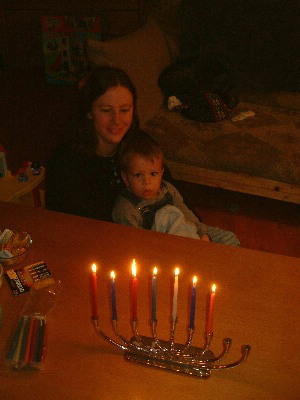 This year we celebrated a little bit of Hanukah, a little bit of Christmas, and a bunch of New Year's. We're still a little uncertain about how we'll celebrate in future years, but no matter what, it's guaranteed that Gregory (and his little sister) will get a ton of presents! Leo had some vacation that needed to be used up, so we planned a sort of last-minute trip to San Diego in December. We were thrilled to get the chance to see Karen's Aunt Linda and Uncle Dave, and stay with Karen's high school friend Jodi, her husband Britton, and their son Jacob who is 6 months younger than Gregory. 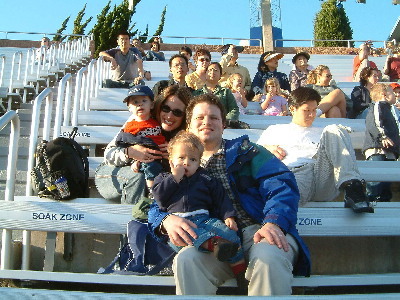 We had a great time going to the San Diego Zoo, Sea World, and some classic San Diego sights. 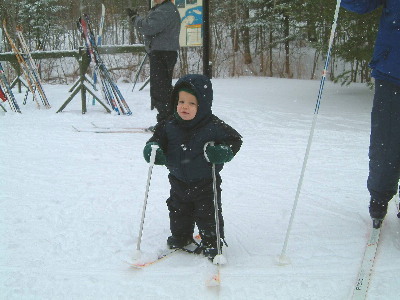 Over Christmas week we headed up to Magog, Canada for some cross-country skiing with Leo's family. Leo's Mom bought some little skis for Gregory and he was fantastic. He loved throwing snowballs and sledding too! 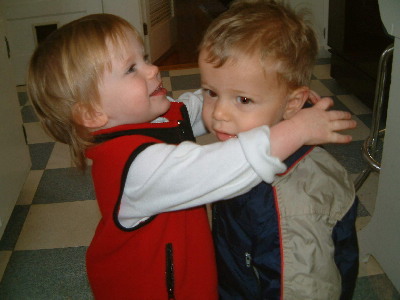 Gregory's language skills were really blooming and he started forming simple sentences. One of his favorites is "More Raffi songs! ", since Raffi is his favorite singer thanks to tapes inherited from the Capeks. We also have a lot of fun in our day-to-day life. 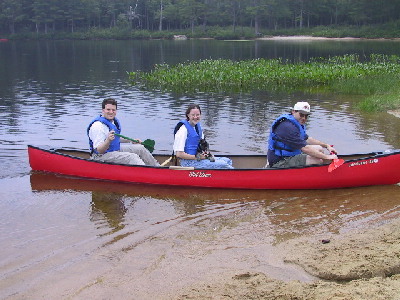 Karen enjoys her day off every week and does fun activities with her friends Pam and Kimberly (among others) who have babies Greggy's age. They go to the zoo, the playground, the children's museum, shopping, music groups, library storytimes and anything else that sounds fun. At night after Gregory is asleep we have been enjoying playing games and watching anime with our friend Dan. 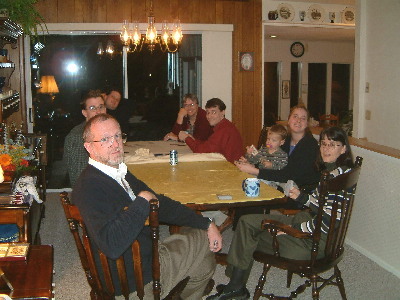 During the weekends we see a lot of Leo's parents and grandparents and Karen's sister. They have been a huge help with babysitting and generally giving Gregory a lot of love. All of our friends and family have been fantastic. Thanks! We loved all the holiday cards that we received this year. We hope all of you have a fabulous year to come and will keep us up to date on all your activities!